MUSIKMESSE 2013: The Frankfurt Musikmesse is a big deal - a massive gear show giving guitar, drum and hi-tech gear manufacturers a chance to launch new products in front of not just a European audience, but eager attendees from all over the world. This year's show takes place on 10-13 April and, as is customary, news of what's going to be making headlines there has already started to slip out. We'll be bringing you all the big reveals as they happen next week, but before that we thought we'd jeopardise our reputation by making a few predictions. 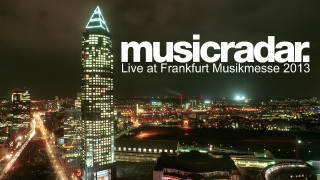 Here's what you can expect at Musikmesse 2013. Fender Troy Sanders signature Jaguar Bass in Silverburst. Quite a specific, we know, but that's because the Mastodon bassist himself gave us the exclusive on it way back in February. Read our Troy Sanders interview to find out more. iPad madness. iPad's are quickly taking over as convenient guitar practice/demo tools and we don't see the trend slowing any time soon. Expect an abundance of new interfaces, FX/training apps and recording options. AudioBus support. Still on the iPad tip, AudioBus has quietly unlocked the device's true music-making potential of late and we expect to see even more firms announce AudioBus support and begin to take advantage of it's pan-app abilities. Fancy feeding your guitar through a synth and then into Amplitube? Now you can - and you don't even have to leave the sofa. The return of solid-state. *Cue thunder and lightning crash* Before all of you valve freaks flip out, solid-state/digital amps have come on leaps and bounds in recent years. Blackstar's ID series is seriously impressive (read our Blackstar ID:260TVP review to find out why), Fractal's Axe-FX II is quickly becoming the choice of those both heavy of tone and wallet and Orange is unveiling it's first 'professional' solid-state amps since the 70s. Something is definitely in the water. The continuing march of 'retro' gear. The music-making industry is pretty self-indulgent when it comes to praising its own past, but recently retro looks and valve purity have totally dominated the guitar market. We're beginning to get bored by it, but nonetheless expect to see about 1,500 guitars and amps that look like they were found in your nan's attic. Nord has been busy releasing multiple stage keyboards and a drum module in recent years, but it's all-but-confirmed that it'll have a new hardware synth at Messe. Our one confident prediction is that it'll be red. UAD developer Universal Audio is promising a "major new recording product" in Frankfurt. A more portable version of the Apollo audio interface/DSP box, perhaps? Korg had loads of gear at NAMM so we'd be surprised if it had much else at Messe. You never know though. A new analogue synth or two is surely inevitable given their current popularity. Who knows where they'll come from, though. Ditto more pad-based controllers, possibly with iPad compatibility.